Churches and fortifications that date back to the Middle Ages overlook five small villages hewn from rock in a cubist arrangement of huddled facades and pantiled roofs. 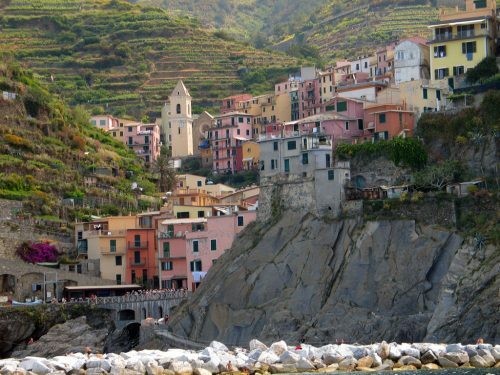 The character of the Cinque Terre villages derives from their topography. Pressed hard against the sea by mountain walls that rise sheer for 600 metres, freshwater streams that tumbled down from the mountain heights dictated their sites. Tiny, dense enclaves arose, crowded around a scoop of harbour, and so the villagers existed, pious and poor, scratching a living from fishing and from the olives, grapes, tomatoes and basil which they cultivated on tiny terraces that they hacked from the cliffs. The dynamics of their isolation changed in the 1930s when Mussolini, invigorated by his success with the Italian railway timetable and the draining of the Pontine marshes, carved a railway line to link the five villages, yet they remained as remote as islands. Their poverty kept the wider world at bay – and insulated the villages from buzzing Vespas, air pollution and aluminium window-frame salesmen. Today, in a world with a taste for peasant chic, the Cinque Terre has become the Cinderella of the Italian Riviera, awake and blinking in the spotlight of its new-found fame. View from the sentieri, the narrow footpaths that have been used by the villagers since time immemorial. There are several ways to explore the Cinque Terre. A leisurely boat trip is perfect. The train is a practical proposition if you’re pressed for time, but this is no place to rush. By far the better option is a hike from one village to the next along the sentieri, the narrow footpaths that have been used by the villagers since time immemorial. 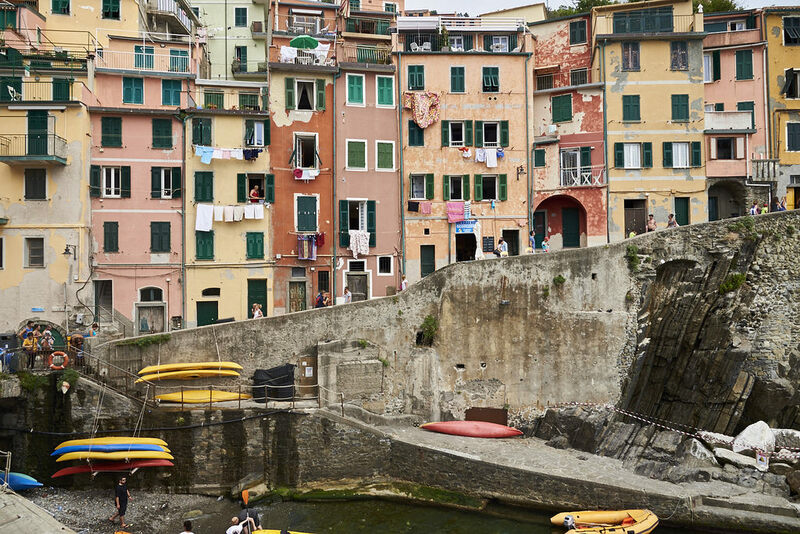 While you could trek the 12 kilometres from Monterosso, the most northerly of the Cinque Terre towns, to Riomaggiore, the most southerly, in a single day, rushing here would be like galloping through the Louvre. Begin at Monterosso, accessible via the early morning train from Genoa or Milan. By far the largest of the Cinque Terre villages, Monterosso attracts a crowd of urban refugees in summer, who hire umbrellas, deckchairs and a few square metres of well-groomed sand for the day on the only beach worthy of the name between here and Riomaggiore. This is not why you came to the Cinque Terre, yet Monterosso is a compressed gem with rewards to make you drag your feet; a knot of alleys so narrow that passers-by must scrape against facades of pink, terracotta, rust, and jade green. 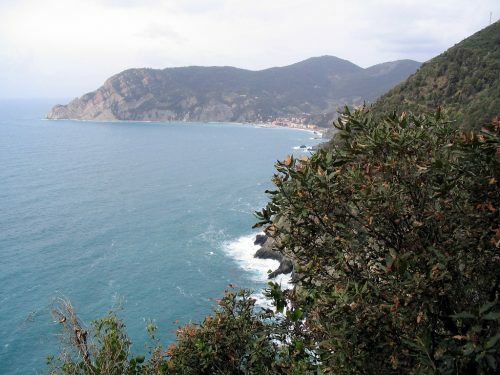 From Monterosso, the Via dell Agarve ascends sharply at the beginning of the two hour hike to the village of Vernazza – the first hour straight up, the second flat. Grapes have been harvested from these sharp hills since the Middle Ages, although the industry has declined now that workers can no longer be found for the back-breaking labour. Against the backdrop of terraced hillsides, the Sentieri dell’Uva, the Grape Roads, are still planted with fig trees to provide shade for the workers, and the grapes are still harvested using corbe, the large wicker baskets that are slung on the back and hoisted up the hills via a monorail system, the only innovation during the past 10 centuries. Vernazza is a rioting mass of tall, narrow, pastel-tinted buildings that steps down the steep hillside to Piazza Marconi and the harbour. This is the sole Cinque Terre village with a natural harbour, and the local fishermen still haul their boats onto the quay to sort their catch and dry their nets in the sun, bringing a note of industry to the tables and chairs of the cafes that spill across the cobblestoned piazza. Locals claim that pesto, the classic Ligurian dish of basil, olive oil, garlic and pine nuts, was invented in the Cinque Terre. Indeed, there is no better place to sample a dish of pasta con pesto than al fresco in Piazza Marconi, preferably following a plate of seafood antipasto. Vernazza is also a tempting place to spend the night in one of several small pensione and private rooms for rent in the back streets, often with a window of a terrace that opens to a postcard view. Come evening and the social instincts of the Italian nation are on display in the piazza as the locals emerge to toss babies into the air, flirt and kick footballs around. The next stage of the walk takes you to Corniglia, climbing out of Vernazza via a staircase that will have your heart pounding against your ribs. Here the trail heads inland through olive groves where big orange nets are suspended to catch the black olives that are allowed to ripen and drop from their branches. Corniglia is the smallest of the five villages, the only one without a seafront and the most labyrinthine. The last two villages are a succession of sun-struck miracles – Manarola another postcard, plastered onto the wall of its ravine, and Riomaggiore, its buildings pressed one against the next. After the roller coaster severities of the Cinque Terre trail, the path between Manarola and Riomaggiore is a delight. This is your dessert – Via dell’ Amore, “lover’s walk” – flat and fast as it runs alongside the sea, and the only place on the sentieri of the Cinque Terre where you could walk and gaze into someone else’s eyes without tumbling off into space. Be warned though – even the love of a lifetime might not be enough to distract you from the glories at every step of the Cinque Terre. 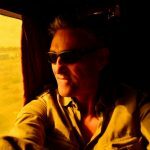 MICHAEL GEBICKI is a Sydney-based travel writer who loves the freedom and sense of the unexpected. 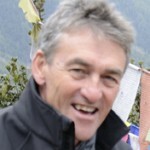 Today he and his wife Liz arrange tours to Rajasthan, Morocco, and all sorts of exotic places. Small groups, slow travel, wonderful places ... all the stuff he loves.